On Jan. 7, a room full of law enforcement officers and community members looked on as a group of activists held a press conference in the Stancil Center of the Mecklenburg County Sheriff’s Office in Uptown Charlotte. Leaders from organizations like SAFE Coalition, Comunidad Colectiva and the Latin American Coalition were there in support of new Mecklenburg County Sheriff Garry McFadden on his 30th day in office. They spoke about how he was living up to his campaign promises to end solitary confinement and resume in-person visitation at the jail upstairs, but mostly they talked about the end of 287g, the infamous program that for 12 years had allowed deputies in the jail to identify arrestees who were in the country illegally and enter their names into a national database used by federal authorities like Immigration and Customs Enforcement, or ICE. “I commend Sheriff McFadden for sticking to his campaign promises to help stop family separations in Mecklenburg County by ending the 287g contract and making members of our community feel safer,” said Sebastian Feculak with the New South Progressives. 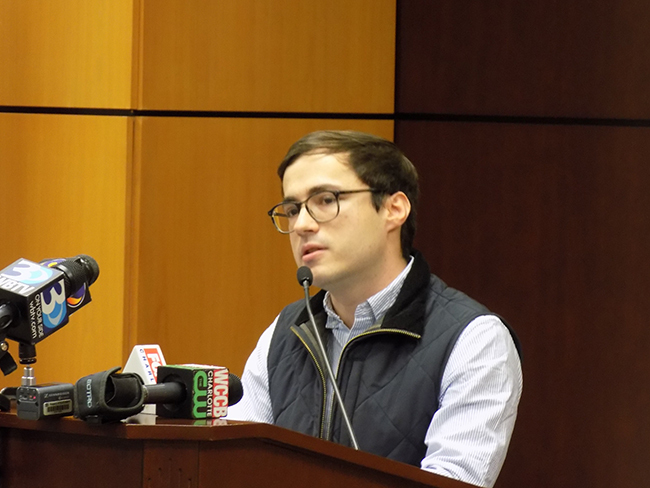 The press conference signaled a fresh start to the new year. In no other time in recent memory had a group of activists hosted an event in support of any law enforcement entity. Stefania Arteaga with Comunidad Colectiva wrapped up the mood of the day with an optimistic tone. “I think overall the message that we’re hearing is that together we’re standing in solidarity — not only standing in solidarity as a community but we’re standing in solidarity with the sheriff that stands for our beliefs, that stands for our community and sees the bright future of Mecklenburg County,” she said. When asked about comments from ICE officials implying that the end of 287g would lead to an increased in immigration enforcement actions on the streets, Arteaga remained steadfast. Just a month later, however, ICE followed through on threats to intensify the enforcement of immigration laws with a sweeping series of arrests in Mecklenburg County and across the state that’s harmed local businesses and left many in Charlotte’s immigrant community scared to leave their homes. Regional ICE director Sean Gallagher has warned that the ramped up raids and arrests will be “the new normal” for counties like Mecklenburg and Wake, where new sheriff Gerald Baker has also ended participation in the 287g program. In response, area activists are mobilizing to confront federal authorities, pressure local officials and help families affected by the arrests. The crackdown began with a raid at Bear Creek Arsenal, a gun manufacturing plant in Sanford, a town of about 30,000 people with a large Latinx and Hispanic population. Agents with Homeland Security Investigations went to the plant on Feb. 5 and began questioning employees in the break room. In the end, agents arrested 27 Bear Creek employees who they said used false documents and fake social security numbers when they were hired. While that action was part of a separate year-long investigation by HSI, it did kick off a week in which 200 people around the state would be arrested by ICE. 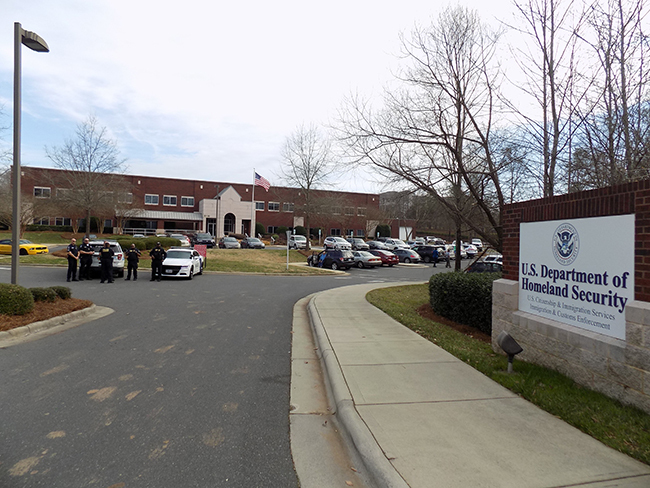 At a press conference at the Charlotte Department of Homeland Security offices on Friday, Gallagher blamed McFadden directly for the increased intensity of ICE actions locally. Gallagher claimed that the Mecklenburg County Sheriff’s Office has been releasing dangerous criminals back out onto the streets since doing away with 287g. In a statement released on Feb. 10, the MCSO stated that no such thing is happening. The release went on to list ways in which the sheriff’s office does cooperate with ICE, including sharing arrestee fingerprint records, honoring criminal warrants from ICE and verifying a person’s citizenship status for felonies and impaired-driving offenses. By the end of the week, more than a dozen arrests had taken place in Charlotte, and Arteaga recorded calls into the Comunidad Colectiva hotline reporting arrests in Hickory, Gastonia, Huntersville and Concord. She and her team relay that information through text to a network of people so that undocumented immigrants can be made aware of places they should avoid. If she’s nearby, Arteaga will drive to the spot where a traffic stop or other ICE action is reported to observe. Adding to the fear was the Charlotte-Mecklenburg Police Department, which on Feb. 6 and 7 ran a “traffic safety saturation patrol” in the Eastway division, using 25 officers from four different area departments to carry out 124 traffic stops in just four hours, just as ICE operations were picking up in an area of Charlotte that houses the largest population of Latinx and Hispanic people. On Feb. 8, CMPD released a statement acknowledging the ICE arrests in Charlotte and stating that CMPD officers “have not and will not participate in ICE immigration enforcement,” adding that they are not required to inquire about a person’s citizenship status or give any such information to federal authorities. Nevertheless, the timing of the aggressive patrolling in the Eastway area did not help put members of the immigrant community at ease. Kimberly Perez, a teacher at Charlotte Bilingual Preschool, said half of her students didn’t show up for school on Feb. 7 as word spread of the heavy ICE and police presence in east Charlotte. Manolo Betancourt, owner of the popular Manolo’s Bakery on Central Avenue, said his business dropped by 75 percent that same day. He said he doesn’t know what to tell his employees when they ask about ICE. 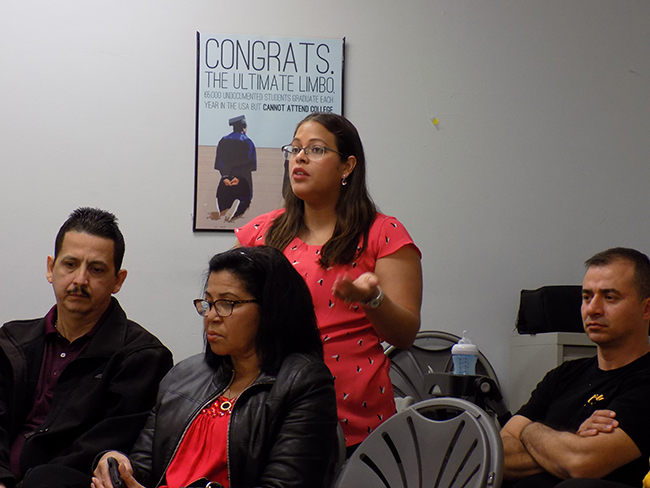 “I feel three different kind of fears: the fear of my customers, the fear of my employees and the fear that I have to face myself,” Betancourt told a group of about 30 people who came to the Latin American Coalition offices on Thursday night to learn how they could help. Jamilah Espinosa, an immigration attorney who attended the gathering, said that her first piece of advice for people dealing with ICE is to remain silent. She pointed out that HSI agents did not know who many of the people working at Bear Creek were until they began to question them. “The best thing that people can do is be quiet,” Espinosa said. “The question that I always get is, ‘Is that going to prevent them from taking me?’ No, that doesn’t necessarily prevent them from detaining you if they have information already that you’re undocumented. But that preserves a lot of your rights, because the first thing that immigration has to do is prove that you are not a citizen of the U.S. or that you don’t have legal status here. Once someone is detained, it can be very difficult to figure out where they’ve been taken, Espinosa said. She quoted a Telemundo report about the Bear Creek Arsenal raid that said it was “like the ground swallowed them,” because families had no idea how to even contact their loved ones, let alone connect them with a legal defense. But the main goal for Espinosa and local advocacy organizations is to not let it get to that point, which is why she’s constantly reminding everyone about the rights that they have if confronted by ICE. For example, many people don’t know that possessing a valid identification or presenting one to law enforcement is only required by law in North Carolina if someone is driving a vehicle. If you’re just walking down the street, you do not need to have or show ID, she said. That’s why organizations like Action NC are hosting Know Your Rights trainings and publishing Immigrant Preparedness Action Kits to help people create a plan that they can implement if they’re ever caught up in an immigration enforcement action. Hector Vaca, immigrant justice director with Action NC, has been a longtime activist for immigration issues in Charlotte, but said ICE has become as aggressive as he’s ever seen them recently. And that’s where change will come from if the community is going to change the new normal. Oh noes! 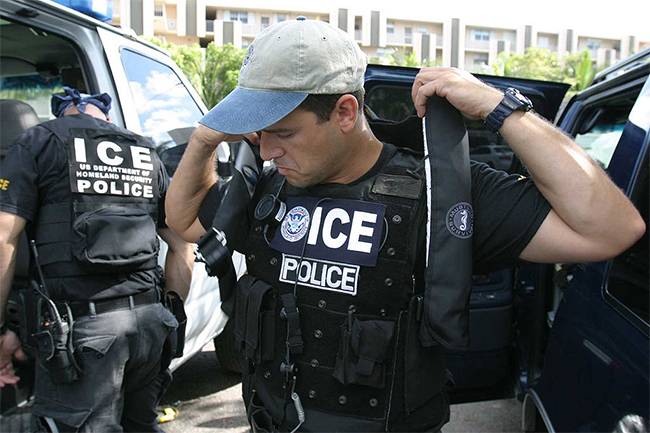 ICE might actually continue what Obama did (enforce the law). This dastardly conspiracy to undermine our civilization must be exposed!